I am addicted! I haven't felt this way since the Sparkly Wheels rage!!!! If you are a bead weaver, you will love the pattern Pop up Pearls Bracelet...an original pattern by Kristen Stevens, Beadwork by KAS. The pattern requires a basic understanding of peyote stitch. And once you get going you won't want to stop. I worked through the first component real slow, to make sure I understood the instructions properly. Kristen's directions and photos are very clear. Once I got the first one right, the second one whipped up quickly, and then I felt like I was on fire! Connecting the components was very easy, I love the design on these connections. Be careful with your connections though - I got a little bit ahead of my self once I started connecting and didn't read through the entire instructions (where Kristen warns about this....). If you notice, there is an uneven amount of picots on the component, so as you start connecting them all you will see that have three picots on the top and four picots on the bottom, your piece will start to gently curve in one direction (great for a necklace!!!!). I noticed the gentle curve about four three or four pieces in and didn't mind at all - I just started going in another direction (so that I had four picots on top and three on the bottome) and I loved the result! I finished my bracelet in one sitting and truly enjoyed making those sweet components! And of course I didn't want to stop there, so I started rummaging through my stash to see what kind of 8mm round beads were there! A pair of earrings was in order on day two! 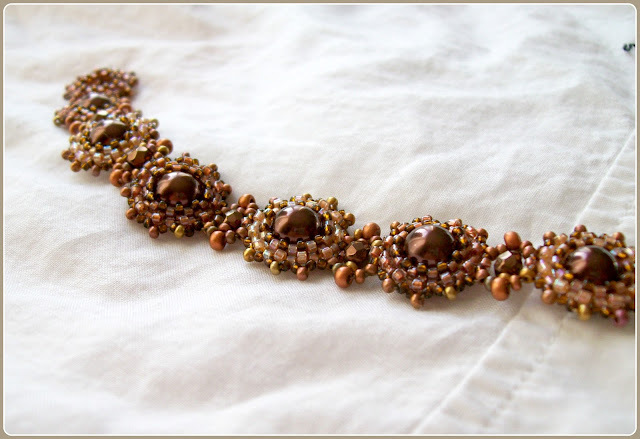 I was impressed by how few beads are actually needed to create this...the bracelet only requires nine 8mm beads, 1g seed, 1g seed, 16 size 8 seed, and eight 4mm of Czech FP rounds. 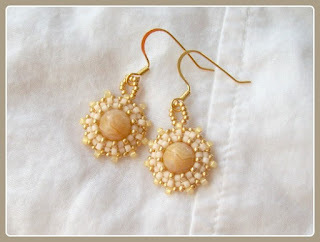 It's definitely a great earring project for "leftover" beads! 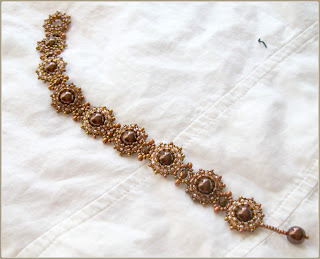 This pattern is a great bracelet, and it works beautifully into a necklace. But I am already addicted to making these into a quick and sophisticated pair of earrings! The final product is delicate yet substantial (an oxymoron - but TRUE), sophisticated, and elegant, yet easily paired with all the casual outfits I've been wearing the past few days! And did I mention I've received tons of compliments on the earrings and the bracelet?? Disclaimer (not that it's needed...): I was not asked to review this pattern, but wanted to because I think this pattern is awesome, and when I think something is awesome I just have to share!!! Great job Kristen! Oh YOU! Comparing them to the "Sparkly Wheels" rage (which I still love making) just makes me giddy. I did notice that the possibilities are endless and I had so much fun whipping them up too. Thank you so much for this review ( and you know you totally didn't HAVE to do it which makes it even more special to me) I feel like a star! Thank you!!!!!!! Oh, I'm so loving the earrings! I've got to find a spare minute between challenges to make some of these! You've definitely inspired me, not that it was needed, I knew Kristen's tute would be awesome!! This bracelet is amazing! Great job Kristen - so happy for you!! I got Kristen's pattern the other day and plan to make it when I have some down time between the other projects I'm working on. Thank you for the tips on connecting the components. I love how your bracelet and earrings turned out.